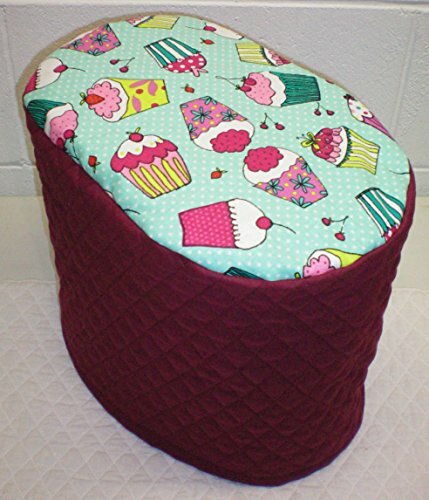 Cupcake Food Processor Cover (Teal & Burgundy, Large) by Penny's Needful Things at Mystic Oaks. MPN: FP2. Hurry! Limited time offer. Offer valid only while supplies last. PLEASE NOTE: Due to your devices color/brightness settings the shade of color may differ when received. Penny's Needful Things handcrafts each item. Large Cover measures 16 inches tall x 9 inches wide x 11 inches deep. Small Cover measures 15 1/4 inches tall x 9 inches wide x 10 1/4 inches deep. Because of the nature of the shape of food processors (squared base, round cup, handle that sticks out) the cover is made to be able to cover the machine. Please measure before purchasing and measure your machine to the best of your ability. If your food processor dimensions are different, send me a message with the dimensions and I will quote you a price to custom make the cover. 100 % Cotton Fabric. Machine wash cold gentle cycle and iron to dry for best results. Machine dry not recommeneded. Please browse the store for coordinating kitchen accessories. If you have any questions about this product by Penny's Needful Things, contact us by completing and submitting the form below. If you are looking for a specif part number, please include it with your message.